Not everything in mathematics is as it seems. As new branches of mathematics are investigated, and as older areas are developed, new proofs and new processes have to be carefully thought out. Even experienced mathematicians have fallen into traps and ‘proven’ things that were not true because of an undiagnosed weakness in their arguments. The algebraic proof at left is a classic example. I remember encountering this in my early high school days and being quite puzzled by it. I could not see where the error was. 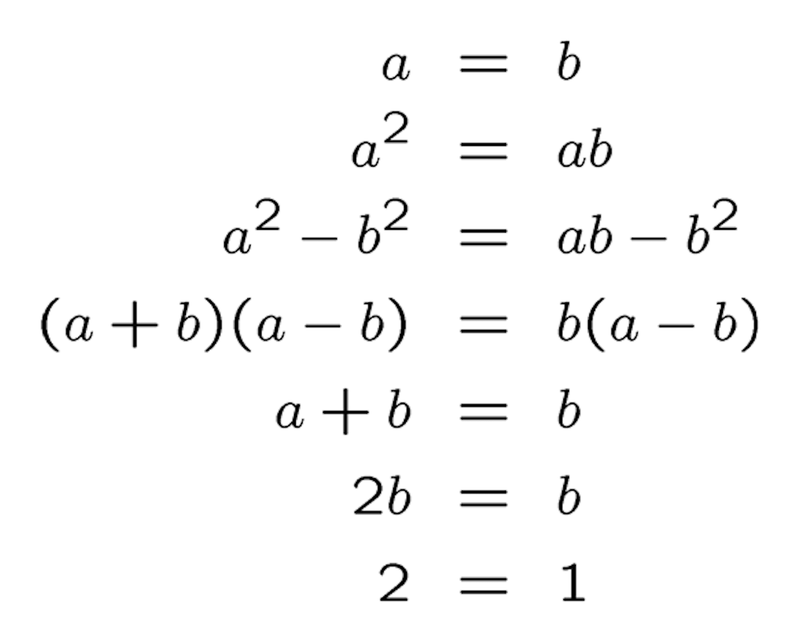 Every step seemed mathematically logical and perfectly acceptable … until I started substituting the same values for a and b to understand what was happening. Suddenly, I realised that (a – b) equalled zero! Both sides were being divided by zero, a nonsensical move, hence the error in the conclusion. Eventually, there will be a small collection of such false proofs here. I encourage you to try to find where the error is before I show you. I am about to 'prove' to you that ALL triangles are isosceles. That is, all triangles have two sides equal in length. I do this by starting with any generic triangle, making a few constructions and then arguing carefully using my knowledge of congruent triangles. Now, you know that this conclusion is not true! So, you (correctly) conclude that I have made an error somewhere, or that I am deliberately misleading you ... but WHERE and HOW? That is the challenge. This is a good way to learn some principles of geometry. Over to you. As a bit of an aside, did you know that the term isosceles comes from the Greek for equal/same legs? Also fascinating is the term scalene. It also derives from the Greek, from a word skalenos, meaning uneven. I have read elsewhere that lame men were referred to using the same word (but have had difficulty finding the reference). So, equal legged triangles stood up straight and lame man triangles had unequal legs! It all makes sense, doesn't it? I hope you enjoy your journey into the realm of geometry. This time, I 'prove' that a right angle is larger than itself (or, that its measure is greater then ninety degrees). You know that my conclusion is false. Therefore, there must be a mistake somewhere in my argument. The challenge for you is to discern HOW I have managed to trick you. 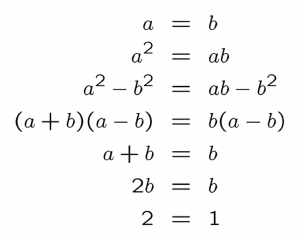 In this way you will learn one of the principles of mathematical proofs ... see if you can tell me what this principle is before I share it with you.